I have worked for twenty joyful years in the community development, community education and recreation sector. In this, I am committed to helping community organisations build capacity, especially their people capacity. I like TetraMap because in our continuously changing world we need tools that will quickly move teams to create sustainable solutions together. TetraMap does that with elegance, science, and a whole lot of fun. I have seen first-hand how TetraMap enables people to better understand one another, reduce conflict, improve communication, and plan together. 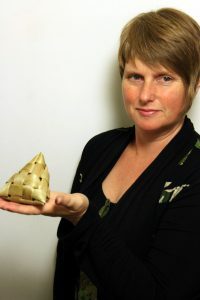 PS: If you like the harakeke (flax) tetrahedron I am holding, please contact me at esther@solsonte.nz, or 021 0290 7864 to buy your own. Esther’s facilitation style is fun, engaging, and personal whilst at the same time on track, ensuring we achieved what we set out to do. The outcomes achieved for us through TetraMap have been instantly noticeable and continue to be put to use. The debriefing sessions were honest and the follow up excellent. I would highly recommend Esther as a facilitator who understands and cares about the not-for-profit sector.